2009 Bottega Vinaia Pinot Grigio Trentino | Wine Splash! Sorry to say this is the last bottle from the case I purchased a year ago. Hoping I like the newer vintage. 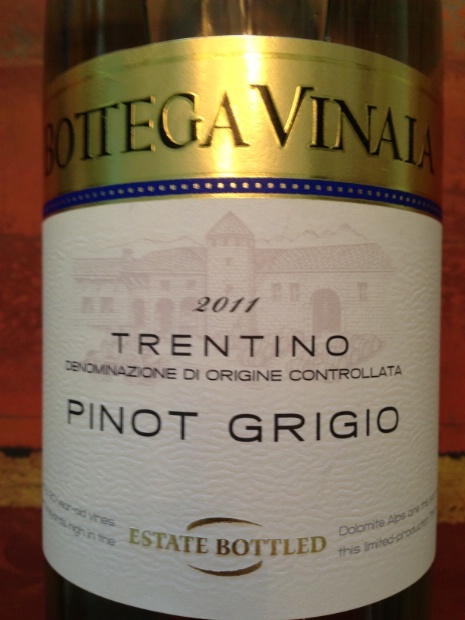 This is a delicious and refreshing Pinot Grigio from the northern Italian region of Trentino. Daybright yellow in color and clear. Wonderful aromas of citrus, lemon peel, melon, and floral. Medium weight in body, soft, with a slight oiliness. Bright flavors of lemon, fresh melon, pineapple, and a hint of honeysuckle. A second sip showed more tropical fruit, ripe peach, and mineral notes. A nice acidity leads to a long, mouthwatering finish! This Pinot Grigio would pair perfectly with roasted chicken, fresh green salad, pasta with a white cream sauce, fish, and medium cheeses. I really enjoyed this Pinot Grigio and give it an 89 point rating! If you have a 2009 vintage, I recommend to drink it before 2014. It is excellent right now! WineSplashing! !